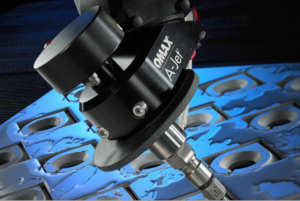 OMAX, a manufacturer of abrasive water jets for machine shops, fabricators and manufacturing companies, discusses how they use TransMagic to solve 3D CAD data problems. Abrasive waterjet cutting is impressive. These sophisticated machines can cut a large range of materials with ease and accuracy, from extremely hard metals to volatile substances, using only water and an abrasive. With the wide range of materials they can cut, industrial waterjets are often used with complex geometries. This is a story of how OMAX and TransMagic work together to solve complex 3D CAD data problems. OMAX’s CNC software is Intelli-MAX. It is very powerful, yet easy-to-use — but it requires a valid solid model in the open standard STEP format. Sometimes, a customer will have a problem with their own 3D geometry created from any number of 3D CAD programs. For example, a common problem is a non-manifold condition.